These 3 wordbooks provide exercises in two major areas of math: arithmetic and geometry. The vivid picture-text supports and motivates children to learn independently in a fun and interesting way. Children practice addition and subtraction up to the number 10 in various ways, and in addition acquire basic concepts of geometry including shapes, symmetry, patterns, and spatial relationships. This workbook helps children develop basic math skills visually. All exercises are designed within the range of numbers 0 to 6 for the beginners. When playing repeatedly, learning math becomes a fun experience for young children. These exercises are essential to establish their first steps to learning math. 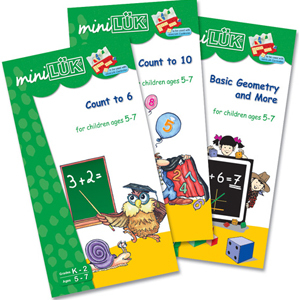 This workbook helps children develop basic math skills visually. It extends the same design philosophy of workbook "Count to 6" and covers numbers from 0 to 10 with more complicated arithmetic operations. This workbook provides a broader range of mathematical exercises. Math consists of many components but the two major ones are the study of numbers and geometry. Geometry deals with shapes, angles, lines, and spatial relationships. This workbook focuses on the basic concepts in geometry: plane and solid shapes, symmetry, patterns, and spatial relationships. Visual perception, concentration, logical thinking, and skills in observation are strengthened at the same time.